Here we will explain how to do device settings with HP tablet PCs. USB cable for connecting to the tablet PC. 1. Connect the cables of the devices. 2. Turn on the scanner. 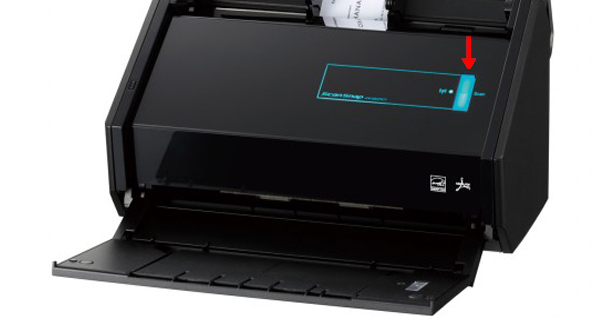 There is no power button for the scanner, but it turns on when you open the cover. When the power is on, the blue light in the picture below will come on. 3. Lightly press the switch on the top of the tablet PC to turn it on. When the PC is turned on, it is set for auto log-in. *The Windows account name will be either "Sansan" . There is no password set. 4. When it is on, the screen below will come up, but please wait and do not do anything until the scanner app screen comes up. 5. When the start up is finished, the scanner app screen will come up. When the scanner app screen comes up, move ahead to doing the internet settings. If you are connecting with wired LAN or DHCP (automatic IP address acquisition), "Connected" will appear in the lower left of the scanner app. When "Connected" appears, the set up is complete. When the devices are set up and the scanner app is open, connect to the internet and try scanning some business cards. Please see the following page for how to connect to the internet with the environment you are using. Connecting the Tablet PC to the internet.